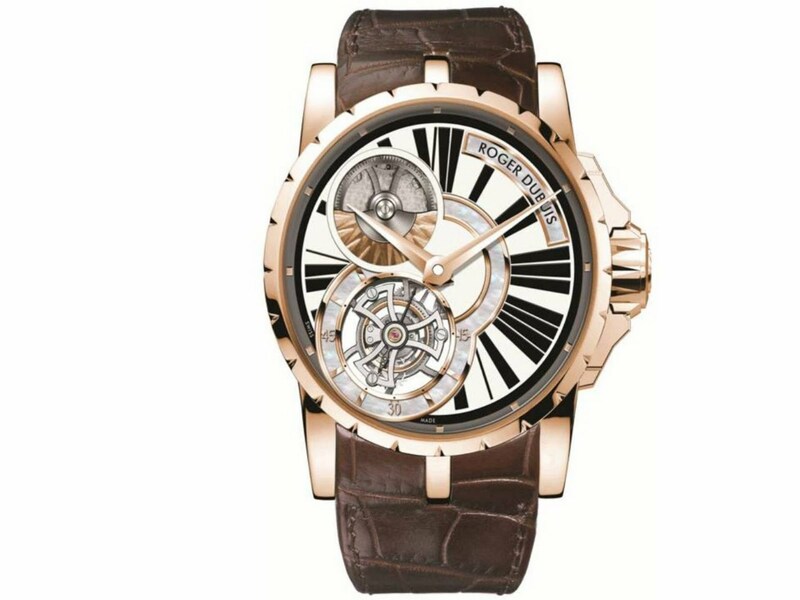 The new Excalibur collection has become more virile, its high-tech movements more visible, and its style more modern. 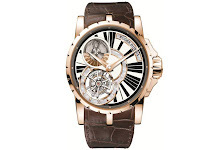 In 2005, the ROGER DUBUIS Manufacture took the watch world by storm with the presentation of a highly unusual model that was as virile as it was original, the EXCALIBUR. With the EXCALIBUR collection, the young watch company proved that “value is not a question of years”, further evidence of the astonishing symbiosis that characterises the Brand, a masterful combination of ancestral watchmaking savoir-faire and a boldly modern style. The Excalibur line is celebrating the most delicate of its complications, the minute repeater, dressed in rose gold. Much of the impeccable Poinçon de Genève finishing of the complex movement can be admired through the openworked dial. The tourbillon, positioned at 5 o’clock, is set off by a rose gold ring enclosed by stylistic grey lines, while a double flange with a minute circle and rose gold appliques, in black and grey respectively, gives the dial greater depth. The hand-sewn alligator strap is enhanced with a rose gold folding clasp. This exclusive model comes in a single limited series of 28. Equipped with the brand new self-winding mechanical movement, one of the collection’s very latest models, the pierced tourbillon, reveals both its micro-rotor and flying tourbillon. The rose gold fillets outline the mother-of-pearl area on a dial designed with a circle theme and accentuate the strength of the large Roman numerals. The rose gold case is complemented by a hand-sewn alligator strap fitted with a rose gold folding clasp. This exclusive model comes in a single limited series of 88. EXCALIBUR, bi-retrograde jumping date. The subtle play of the Arabic numerals, which border the two symmetrical anthracite bi-retrograde date zones, blends harmoniously with the white gold applique hour-markers. The black inner flange, punctuated with Arabic numerals, encircles the dial and gives it its strong character. This brand new movement, which enriches the Manufacture’s range of products, is housed in a white gold case. The hand-sewn alligator strap is fitted with a white gold folding clasp. This exclusive model comes in a single limited series of 88.